Barry’s, the original cardio and strength interval workout that innovated group fitness with its efficient, immersive and transformative hour-long workout experience, is now open at The Street. During its first 30 days open, Barry’s at The Street will offer 3-class packages for just $75. Founded in Los Angeles in 1998, Barry’s was conceived to make getting into the best shape possible and fun. Barry’s signature method utilizes the most effective combination of High Intensity Training (HIT) by incorporating 25-30 minutes of interval-based cardiovascular routines on treadmills with 25-30 minutes of strength training using free weights, resistance bands, and more. The workout is results driven — pushing participants to their physical and mental limits — and efficient. A one-hour class incinerates fat, burns up to 1,000 calories, and releases stress. Additionally, the studio calendar is uniquely customized to focus on a different body part each day of the week, offering participants a complete, full body fitness regime. Barry’s promises that no class is ever the same so participants never plateau. Barry’s classes are held in dim lit, red studios to motivating playlists. The atmosphere adds an element of excitement to the workout while enabling participants to dig deeper and lose themselves in the physical moment. Barry’s instructors coach and motivate the group to run and work harder than they ever thought possible. Working side by side as a community creates strong bonds between participants who inspire, support, and hold each other accountable inside and outside of the studio. 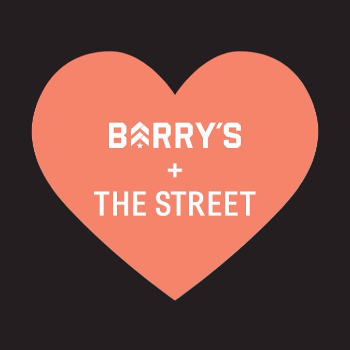 Barry’s at The Street features a 42+ person studio with 21 custom designed Woodway treadmills, which are known for their friction free surfaces and are the treadmill of choice for elite athletes. Studio amenities include men’s and women’s locker rooms with premium products, Barry’s own retail line, and a signature Fuel Bar, serving a newly introduced menu of healthy and energizing smoothies and snacks, each designed to help clients reach their fitness goals. For the best workout possible in under one hour, Barry’s at The Street offers 50-minute classes seven days a week. Classes start at $30 for a drop-in, but are also available at reduced rates for class packs and memberships. During its first 30 days open, Barry’s at The Street will offer 3-class packages for just $75 (valid only at the Chestnut Hill studio) and $20 classes for first time participants (valid at both Downtown Crossing and Chestnut Hill studios).